As the premier outfitter in the region, Gabino's Outdoor Adventures has sole access to hundreds of thousands of acres of prime shooting habitat. Experienced guides and spotters are in the field, morning and afternoon, providing up-to-the-minute reports on the best hunting locations. This is Mexico's best dove shooting - wave after wave of hard-flying whitewings and acrobatic mourning doves. Each shooter is provided with a pick-up boy, a comfortable swivel seat with back rest, lots of 28, 20 or 12 gauge shells, and a cooler of soft drinks, water and beer. 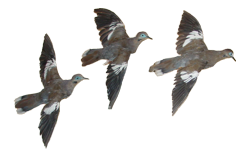 When you think of whitewing Dove, several things immediately come to mind - fast paced shooting, evasive birds, and Mexico! And very few places on earth can compare to the large number of birds of Mexico's Northwest. The community of Cajeme lies in the heart of this agricultural region. This beautiful area, with its natural nesting habitats and vast grain fields, attracts literally MILLIONS of Whitewing and Mourning Dove! You simply have to experience it for yourself to believe it. Gabino's Outdoor Adventures offers small, private hunts on several local ranches just a short drive from the beautiful La Nellita Hacienda. This is the finest dove hunting you will ever experience. 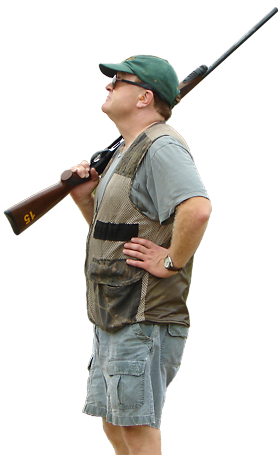 Gabino's staff will see to your every need, including transportation, bird boys, meals and even shotguns (Benelli or Beretta automatics in 12 or 20 gauge) if you want them. In fact, the only thing we don't do for you is pull the trigger!